USS Wakulla (AOG-44), underway, date and location unknown. US Navy photo from the collections of the US Navy Memorial. "Stanvac Ogan" in Palembang 1956. 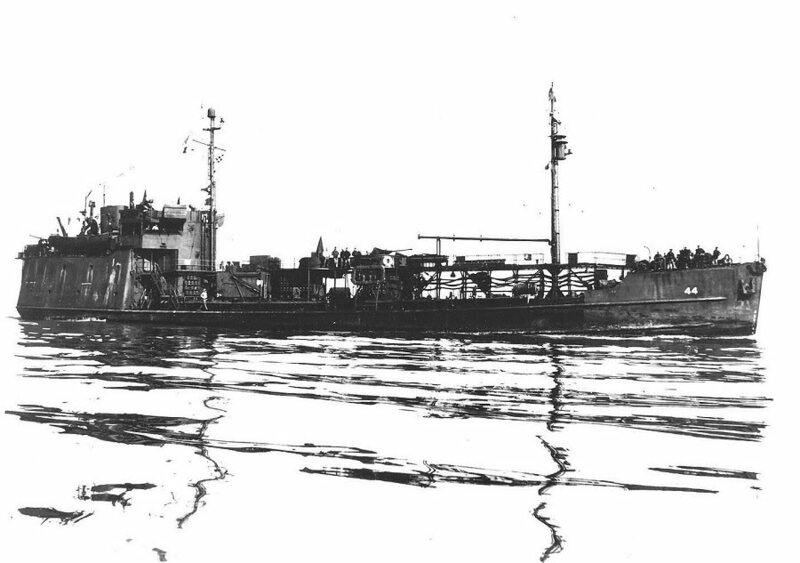 "Stanvac Ogan", build 1945, as "Wakulla AOG 44", by East Coast Shipyards Inc., Bayonne, N.J..
(date unknown); Final Disposition, fate unknown. Propulsion, diesel direct drive, single screw, 720hp. The Miramar Ship Index for "WAKULLA"
Scrapped 1980, [ reported in 1982 ]..
on 3 February 1945, Lt. Clifford G. Pickering in command. put to sea and tow LST-765 into port after a damaged screw and an inoperable rudder had left the tank landing ship adrift. Commission on 14 November 1946.